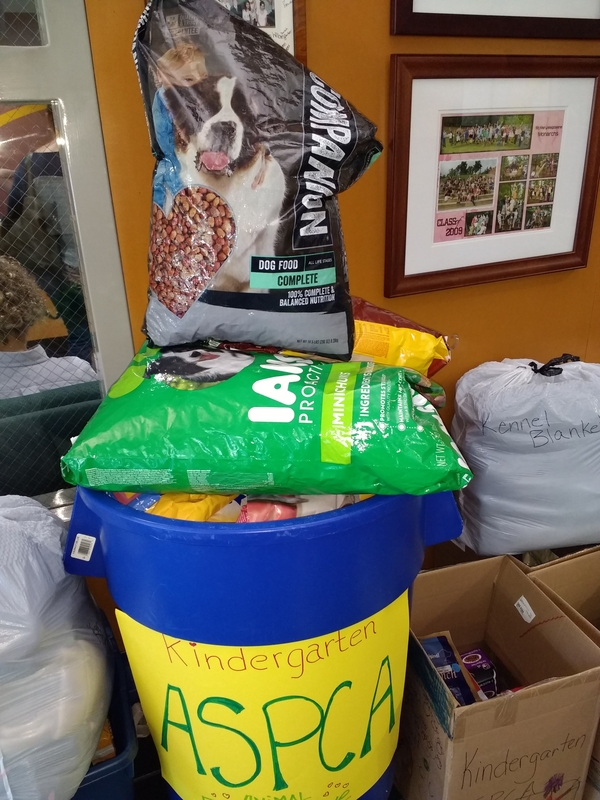 Our kindergarten students collected food and supplies for the SPCA of Wake County in honor of St. Francis and his love of animals. 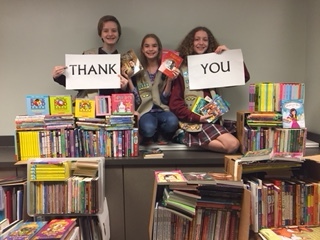 Girl Scout Troop 1383’s book drive was an incredible success! We would like to thank everyone who donated books and supported our efforts in so many ways. The girls collected 2,695 books to donate to Book Harvest! We are very grateful for the amazing generosity of both the St. Mary Magdalene school families and parishioners who made this possible. Second grade is hosting a shoe drive from Dec. 1st to 8th. During this season of giving, we are asking you to please donate new or gently used shoes to those in need. Boxes will be located in the school lobby for you to deposit your shoe donations. Please tie laces of shoes/sneakers together before bringing them to school. For shoes/sneakers without laces, kindly place them in a plastic bag. The shoe donations are given to Brown Bag Ministry who distributes them to those in need. These essential items of living will be greatly appreciated, especially with the cold weather. Thank you for supporting this important service project. 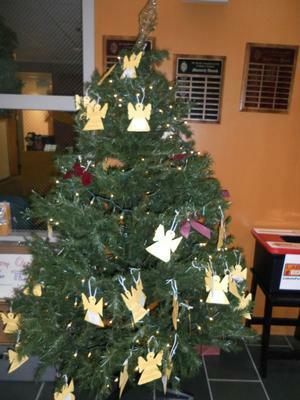 St. Mary Magdalene Church has placed The Angel Tree in the Activity Building lobby. It is filled with ornaments for needy children from Catholic Parish Outreach and Western Wake Crisis Ministry. Attach the ornament to the gift/food/contribution to help us track all donations. Feel free to wrap or bag gifts for the children (star tags). No other gifts should be wrapped. All contributions should be placed under the tree no later than 12 noon on Dec. 18th. Kitten Food (Canned and Dry) and Puppy Food (Dry) - For the health of our shelter pets, we need high-quality brands like IAMS, Purina and ScienceDiet. The first ingredient should be meat, not a filler or by-product. Gift Cards to Target, PetSmart and Petco (*Gift cards are used to purchase prescription medications and prescription food). 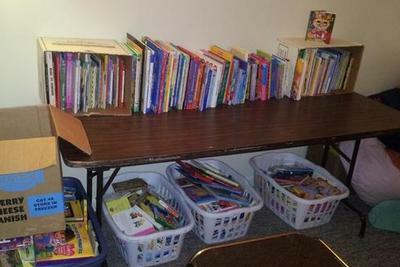 Brownie Troop 532 is having a book drive the week of May 9-13 for their spring service project. They are looking for new or gently used books for pre-K – 2nd grade readers. Students can drop books in one of the bins in the school lobby. All donations are greatly appreciated and will go to a school in Durham. Last week, our middle school students led, promoted, and managed our school-wide food drive for Catholic Parish Outreach. The 7th and 8th grade students in the Monarch Leadership and Service Ministry (MLSM) announced the food drive to the student body after Mass and during afternoon announcements. 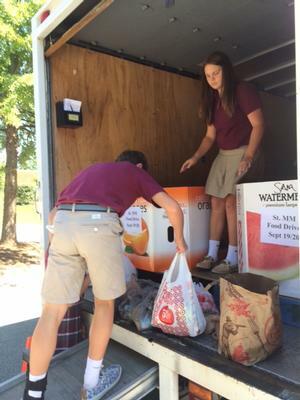 They collected food during carpool, then loaded it on the CPO truck at the end of the week. Later in the year, students will have the opportunity to go to the CPO facility to package food for the families that need it. This is a great way for our students to participate in community service from start to finish! StMM families help keep the roadside in front of StMM looking beautiful! 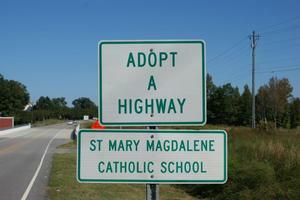 They assist in cleaning up our adopted portion of Apex Barbecue Road (part of the NC Adopt-A-Highway Program). We need volunteers to spend one hour to help remove trash from the roadside. Volunteers meet in the StMM parking lot to get supplies (bags, gloves, and safety vests provided). Participants must watch a short safety video before joining the cleanup. Rally for Cystic Fibrosis is an 8th Grade Religion Class Service Project designed to raise awareness of this genetic disease and money for the Cystic Fibrosis Foundation. Students have been working on this service project since the fall and are excited it is almost here! Morgan Pirozzi and Julia Kleiber are the student leaders of this project. These young ladies have a personal interest in this foundation because they have a friend who suffers from Cystic Fibrosis and want to do what they can to help her. 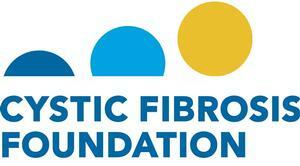 All proceeds will go directly to the Cystic Fibrosis Foundation. Donations to the bake sale greatly appreciated – contact Mrs. Blum. 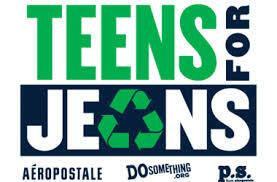 We will be collecting jeans of all sizes that will be donated to local youth through the Teens for Jeans program. MLSM students will be filling stocking and distributing them to local needy children. DECEMBER 5 - NICKELS FOR ST. NICK. In honor of St. Nicholas, a man known to tend to the needs of the poor, the MLSM will be collecting nickels (and other loose change) during carpool. All money collected will help to offset the cost of materials needed to run the MLSM, who are the "St. Nick's" of our school community. Please support the St. Nick Shoe Drive - 2nd grade will be collecting new and gently used shoes in the school lobby from Dec. 5 - 12 - place your donations in one of the bins. Robert Callus, an alumnus of StMM and a senior at the University of Notre Dame, spent nine weeks this summer at the Holy Cross mission in Uganda. 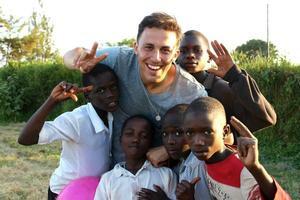 This mission is located in the village of Kyarusozi/Cherasozi and is run by Father Richard Potthast. The mission is in the position of supporting many children and families in the village, and their need for support is great. Our third grade students held a bake sale in October, with all proceeds going to the mission. The third grades also accepted cash donations in support of the mission and raised almost $2000. The kindergarten classes collected over 475 items that will be donated to the Wake County SPCA. This collection is done in recognition of the feast of St. Francis Assisi. The kindergarten students send a big shout-out to everyone that contributed! THANK YOU, THANK YOU, to all who donated to Catholic Parish Outreach Food Drive and Water for Hunger Challenge this week. As a school we collected over $2000 and filled almost 3 of the large corrals in the CPO truck with food (normally we fill 2). We will be collecting new and gently-used jeans from February 3-7. Middle-school and adult sized jeans will be donated to homeless teems in Wake County. Elementary sized jeans will be donated to other organizations. Any student that donates a pair of jeans can wear jeans to school on February 7. The MLSM organized the fall food drive through the Catholic Parish Outreach's H20 for Hunger Challenge. We collected 4600 pounds of food items and $2570 in cash donations. 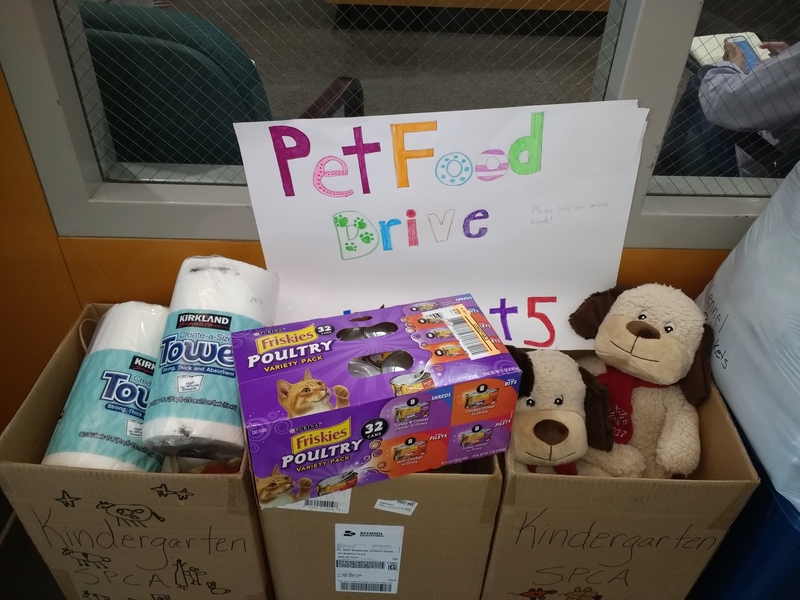 Our kindergarten students and teachers are coordinating our annual pet food drive. Donations can be brought to the school lobby from October 4-11. 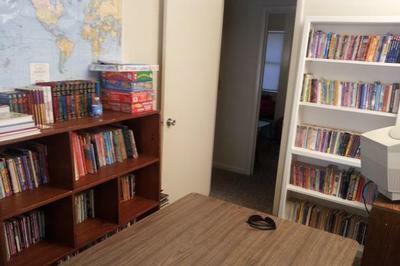 Our students collected about 3000 books and helped convert the Stone Crest community room into a library. We partnered with the Great Minds program from Pleasant Grove United Methodist Church (PGUMC). The Great Minds program provides activities and homework help for 1st – 12th grade students from the Stone Crest community. 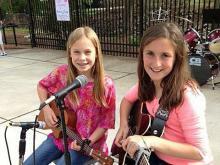 Some StMM middle school students took to the stage at Pullen Park in May in a benefit concert to help the victims of Hurricane Sandy. The students decided to do this after they learned that one of their teachers, Tara Navarro, had family members who collectively lost more than 20 homes in Breezy Point New York. Read the rest of the WRAL.com article here. After Mass on March 7, a group of 7th grade girls from the MLSM presented a Lenten School wide Service Project called Helping Camp PEARL. Camp PEARL is a summer camp for special needs teens and young adults. This is camp is in need of various art supplies to help run the camp. We will have a bulletin board in the lobby with white paper pearls containing the items needed for the camp. Students will be asked to pick a pearl, bring in the item and place it in the bins in the lobby. We will be collecting the items for the next 2 weeks of Lent. Our second-grade classes are conducting a gently-used shoe-drive. All of the shoes will be donated to the Brown Bag Ministry, which will handle the distribution of the shoes to the homeless men in downtown Raleigh, to Laurel Park Elementary School and to the Salvation Army. Shoes will be collected the week of December 3. Christmas Stocking donation: This year the MLSM Giving Tree (which will be in the lobby of the school) will be asking for items to fill a needy child's stocking. We have already purchased the stockings, and our tree ornaments will identify a child - boy or girl, and their age. Those that would like to take an ornament can fill a 1 gallon Ziploc bag with goodies that a child might want and/or need. Bins will be available in the lobby of the school for people to return the filled bags. Students then will fill the stockings with the items purchased on the afternoon of December 14th. For the South Wilmington Street Men's Shelter, our students are making Christmas cards. The cards will be added to gift bags that will be distributed at the shelter on Christmas Eve. The gift bags will also include blankets, socks, hats, gloves, toiletries and Christmas cookies and candy. 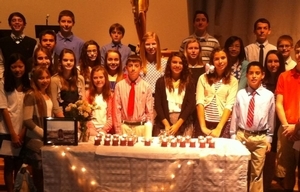 For the victims of Hurricane Sandy, our MLSM students conducted a school-wide prayer service (photo at left). We also collected blankets to be delivered to the New York/New Jersey area, and collected over $4000 for Catholic Charities. WRAL recently did a report on our school's activities. *For the health of our shelter pets, we need high-quality brands like IAMS, Purina, and ScienceDiet. The first ingredient should be meat, not a filler or by-product. Non-Perishable Food Collection: September 10-14. Our MLSM is heading up this project to benefit the food pantry of the Catholic Parish Outreach organizaion. Canned goods and other non-perishable items can be donated in the school lobby. Aid the Homeless With a Click of your Mouse! Brown Bag Ministry (BBM), a nonprofit serving the homeless that operates out of St. Andrew the Apostle Catholic Church in Apex, as well as three other Triangle Catholic churches, is one of 51 finalists in a national competition to earn up to $50,000 in funding. BBM is the sole North Carolina representative for the Tom’s of Maine Fourth Annual “50 States for Good” initiative. Winners are determined by public vote, so please cast your vote at www.Facebook.com/TomsofMaine “Cast your Vote” now through Oct. 9 by choosing either “North Carolina” or “Brown Bag Ministry” (you can vote as often as once a day). And please spread the word! Every year BBM provides more than 115,000 brown bag lunches and over 5,400 hot lunches to the homeless and those living in poverty. To learn more about the ministry, volunteer and donation opportunities, and a link to the competition vote site visit at www.brownbagministry.org. We are so happy to report that the Brown Bag Ministry was awarded a $20,000 grant from Tom's of Maine. Thank you to everyone that voted! This is such a worthwhile ministry, and we are proud to be part of it! 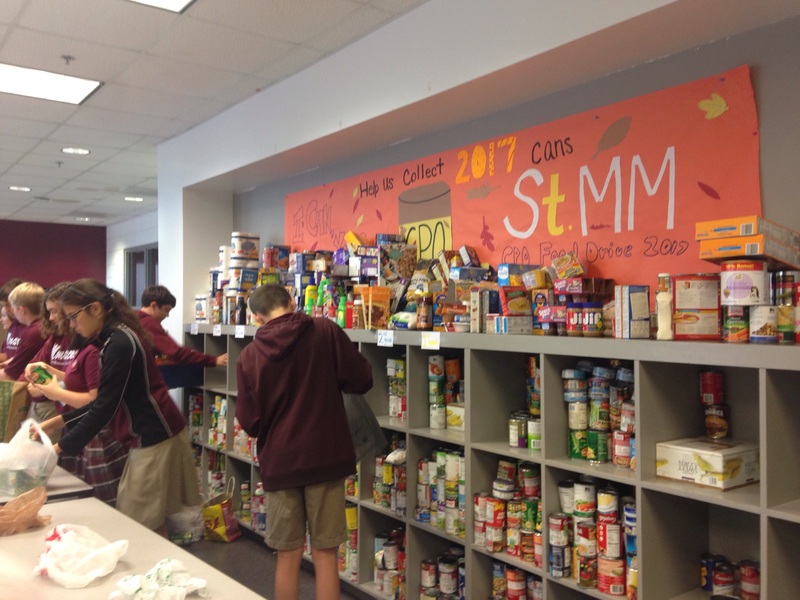 STMM school will participate in Catholic Parish Outreach’s (CPO) “Feed A Family” food drive this week (Tuesday, April 17-Friday, 20). This food drive is being in held in conjunction with the STMM parish food drive next weekend (April 21-22). Any non-perishable food items may be brought into the school lobby beginning Tuesday. Our efforts will help to replenish the Catholic Parish Outreach food bank after the Easter holiday. 1. The Giving Tree. We are collecting gift cards from Target and Wal-Mart to help purchase gifts for 400 local needy children. There are envelopes in the homerooms and in the office for donations. 2. Saint Nick Shoe Drive, Dec 5-9: the 2nd grade will be collecting new and gently used shoes in bins in the school lobby. 3. Meg's Smile, Dec 8-9: This is a foundation the 6-8th grade will be raising money for to help create "wishes" for terminally ill children in our local community. The 6th grade will host a bake sale next Thursday and Friday (Dec 8/9) during all lunches and the 7/8 graders will be having a dance to raise money for this organization. 1. 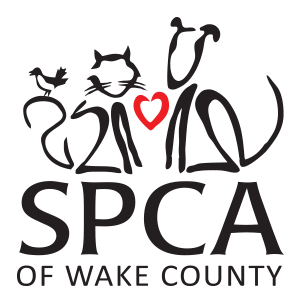 Pet Food collection: Oct 3-7. Kindergarten coordinated this project in honor of the Feast of St. Francis of Assisi. We collected 200 items for dogs, including 160 cans of food, and 235 items for cats including 21 bags of dry cat food. 2. Non-Perishable Food Collection: October 12-18. Our MLSM is heading up this project to benefit the food pantry of the Catholic Parish Outreach organizaion. Canned goods and other non-perishable items can be donated in the school lobby. 3. Terracycle Project: October 27 – November 4. Sponsored by the MLSM - the kick off for this will be after Mass on Oct. 20. It is a 'green' project, where the students will collect the wrappers from their Halloween candy. All wrappers are sent to an organization called Terracycle; that organization recycles the wrappers into colorful book bags, pencil pouches, etc. The earnings then help 3rd world countries with food, medical supplies, and water. The MLSM students are very excited about this project and have been planning it since last spring. 4. Cards for Wounded Soldiers: Ongoing, monthly.